Interest Rate Decision was released in New Zealand there was RBNZ Press Conference. The US will publish Inflation Rate, EIA Crude Oil Stocks Change and Monthly Budget Statement. 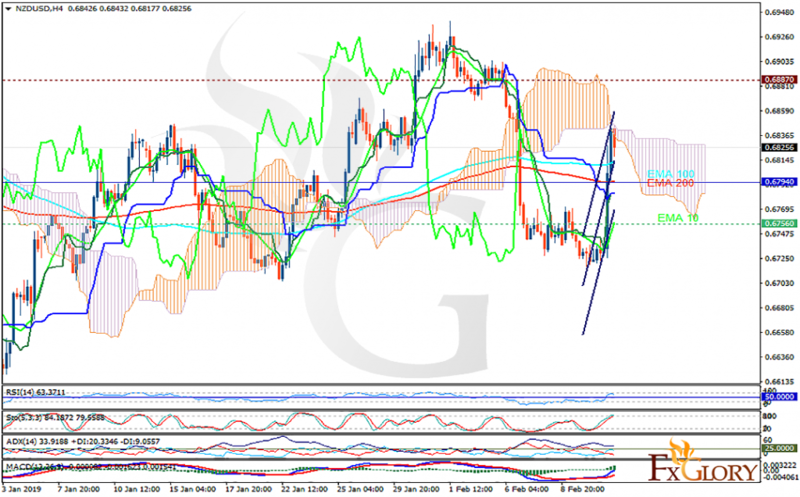 The support rests at 0.67560 with resistance at 0.68870 which the weekly pivot point at 0.67940 is located in between the lines. The EMA of 10 is moving with bullish bias in the ascendant channel and it is below the EMA of 200 and the EMA of 100. The RSI is moving in overbought area, the MACD line is above the signal line in the positive territory and the Stochastic is moving in high ranges. The ADX is showing buy signal. The price is in the Ichimoku Cloud and below the Chinkou Span. The Tenkan-sen and the Kijun-sen are both showing an upward trend. NZDUSD is trying to find some consolidation around EMA 100 area. Buyers can target 0.686.